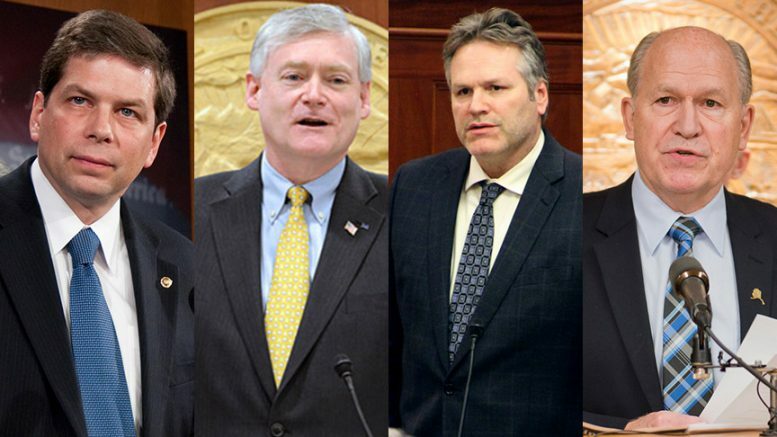 The leading candidates for Alaska governor: Mark Begich (D), Mead Treadwell (R), Mike Dunleavy (R) and Gov. Bill Walker (I). Gov. Bill Walker is nearing on a half-million dollars raised for his re-election bid, according to campaign finance reports filed with the state on Monday, putting him well ahead of the field, but last-minute entrant Mark Begich has had the strongest fundraising period since the June 1 filing deadline. A grand total of $1,784,166.92 has been poured directly in to the campaigns for governor and lieutenant governor throughout the entire 2018 election cycle, according to an analysis of the latest fundraising reports by The Midnight Sun. Today, we’ll break down just how the leading candidates stack up against each other in the fundraising game. The 30-day reports cover campaign fundraising between Feb. 2, 2018 and July 20, 2018. There’s a lot of different ways to break down this information to glean some insight to where each campaign currently sits like total fundraising, fundraising during specific periods, number of contributors and remaining cash. This snapshot of the race doesn’t consider the impact that political action committees and independent expenditure groups supporting candidates indirectly will have on the race. Republican front-runner Mike Dunleavy has so far been the biggest beneficiary of this type of outside spending with an the independent expenditure campaign Dunleavy for Alaska, which reported a total of $608,940.00 in contributions. There’s also a pro-Mead Treadwell group, Mead Treadwell for Alaska’s Future, that’s raised $31,550.00. Neither Walker or Begich have decided independent expenditure groups supporting them. The 30-day reports cover everything from Feb. 2, 2018 through July 20, 2018. During this time period, Walker topped the field with a grand total of $220,558.11 raised, continuing the strong and consistent fundraising effort we’ve throughout the race. His running mate, Democratic Lt. Gov. Byron Mallott, also topped the field of candidates for lieutenant governor with $102,238.80. Their running as independent candidates gives them the advantage of being able to coordinate fundraising efforts, which allowed the duo to raise $322,796.91 during this reporting period. Republican front-runner Mike Dunleavy raised $163,561.05 during this period, putting him squarely in second place. His fundraising efforts had lagged behind that of now-withdrawn Republican candidate Scott Hawkins, who put more than $200,000 of his own money into his campaign. Dunleavy’s now surpassed Hawkins’ numbers with a total of $251,232. Dunleavy’s the only candidate for governor who’s not given his campaign any money. Republican Mead Treadwell and Democrat Mark Begich round out the field with $112,762.48 and $133,373.69, respectively. Both numbers are far cries from Walker and Dunleavy, but we’ll get more into why they’re in reasonably good positions in the next section. Here, we’ll look at the fundraising between June 1, the final day to file for office, and the end of this reporting period. This is the period of time that gives Begich and Treadwell, who both entered on the final day of the race, the best news. Both candidates topped their prime competition in terms of fundraising: Begich topped Walker by $24,412.26 and Treadwell topped Dunleavy by $47,093.09. Even when accounting for the $25,000 that Treadwell gave to his campaign, he’s still on top of Dunleavy during this time period. Begich also received a $25,000 boost from the Alaska Democratic Party. Begich had the strongest fundraising of any candidate since the filing deadline, raising a grand total of $133,373.69 during those 50 days. Walker still came in second with $108,961.43. Still, it’s hard to necessarily compare these numbers as apples-to-apples with candidates that have been fundraising since last year. Walker, Dunleavy, Mallott and Meyer have already tapped many of the big-dollar donors out there so we’d expect their fundraising to slow as we get closer and closer to the election. Another notable takeaway from this period is that Republican candidate for lieutenant governor, Lynn Gattis, ceased fundraising. Both Grunwald and Meyer continued fundraising during this time. Gov. Bill Walker tops the total fundraising at this point with a grand total of $496,007.92 collected through all contributions. His running mate, Democratic Lt. Gov. Byron Mallott, has also raised $256,130.61 from all contributions to this point giving the duo a combined total of $752,138.53 so far. Mike Dunleavy, the leading Republican candidate, comes in next with $251,232.05 collected from all contributions. Democrat Mark Begich and Republican Mead Treadwell both entered the race on the final day of filing and have quite a bit of ground to make up, but have shown strong fundraising so far. Begich comes in with $133,373.69 and Treadwell comes in with $112,762.48. Here’s the amount of remaining cash that each campaign says they have on hand moving forward. Another area that candidates like to cite when talking about support is the number of contributions received by each campaign. We filtered through all the individual contributions to find the number of people and groups (unique names) contributing to each candidate. To get to the average contribution size, we took the total income minus the contributions made directly by the candidate and divided it by the number of unique people and groups listed in the income reports. This number includes contributions from PACs, which can be above $500. It can also include individuals contributing more than $500 by contributing both during this year and last year. Now-withdrawn Republican gubernatorial candidate Mike Hawkins topped the list for investment in his own campaign with a whopping $200,001.00 given to his campaign, according to our analysis. Every other candidate has contributed personally to their own campaign, though most are listed as non-monetary contributions. Be the first to comment on "Begich leads field in fundraising after the filing deadline, but Walker’s still on top: State of the Race"